Audi and HERE Technologies continue to integrate their services for even greater customer benefit. 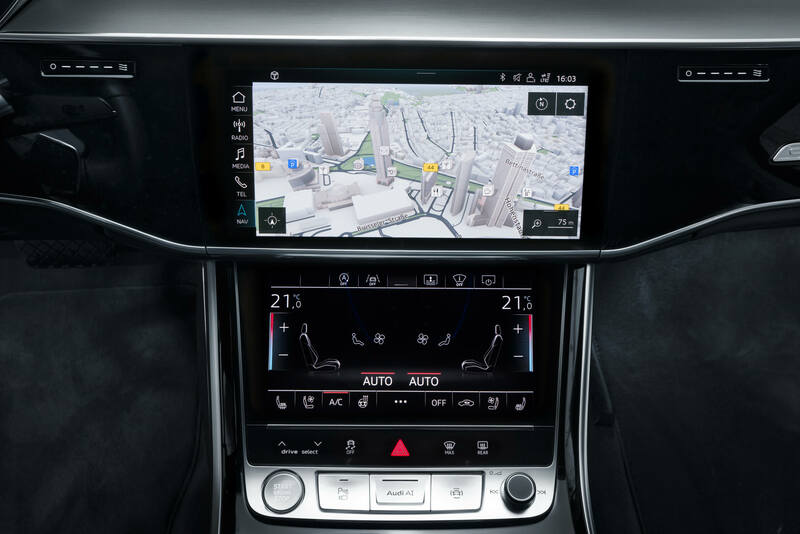 In the new Audi A8 luxury sedan, the automobile manufacturer offers an array of technologies and services created by the map developer. Audi participates in HERE together with other companies. Both sides plan to intensify their collaboration in future. The progress is already evident in the map view with direct destination input: The latest version of Audi’s modular infotainment platform (MIB2+) offers a navigation map with much clearer graphics. It combines highly detailed 3D models of cities worldwide with correspondingly realistic representations of many buildings. One of the highlights is the new hybrid navigation. Route calculation takes place primarily online on HERE’s servers, and in parallel on board the car. It takes account of the overall traffic picture throughout a region. The system even includes events far off the planned route if they could potentially have an impact on it. Information is permanently updated at frequent intervals. The data transfer between the car and the HERE backend uses the currently fastest mobile communications standard LTE Advanced. This constant exchange and the high computing power of the HERE servers create scope for new functions: If the driver discovers that a section of their route becomes blocked at short notice, they can obtain a local diversion directly and very easily. If they want to change the suggested route, they can enlarge the section in question on the display, then simply trace the new route with their finger and activate it. The new myAudi smartphone app also uses HERE navigation software and seamlessly synchronizes navigation destinations and favorites with the car via the cloud. This enables the customer to start destination input from their smartphone before they even get into the car. The myAudi app takes them to the car, the navigation system continues route guidance in the car with no need for an additional, separate procedure and the app then guides the driver on to their destination address once the car has been parked. The navigation software in the car uses the HERE database and also evaluates information on the course of the road. This includes the number and direction of lanes, the edges of the roadway, bends, descents and inclines, junctions, roundabouts and city limits. This data is used by various safety, convenience and efficiency functions such as predictive adaptive cruise control (pACC) and predictive efficiency assist PEA. The central driver assistance controller (zFAS) also processes the data. The controller receives the road data along the route from the navigation system, merges this with the data picked up by the on-board sensors and uses the results to determine e.g. the exact position of the car in its lane. The map data in the Audi A8 is updated automatically every three months over the permanent online connection. In the medium term, Audi will also team up with HERE for traffic sign information and hazard information, which are car-to-X services from the connect portfolio. The Audi models A4, A5, Q5 and Q7 use their on-board sensors to gather this information on speed limits and hazard points. At the moment, the information is still collected on Audi servers, processed and made available to Audi drivers. AUDI AG, in a consortium with the BMW Group and Daimler AG, purchased HERE Technologies, one of the leading software companies for digital navigation maps and location-based services, from the Nokia Corporation at the end of 2015. HERE is designed as an open platform and currently employs around 8,000 people worldwide. Since its takeover by the consortium, the company has steadily been expanding its network of expertise in IT through new participations and strategic partnerships. One of HERE’s main projects is the HD Live Map. This provides the digital basis for future piloted driving. The new data platform describes the traffic space as a three-dimensional model with unprecedented precision. It is accurate down to the centimeter rather than the meter, and dynamic rather than static. The HERE HD Live Map is currently in the setup phase, and the new Audi A8 is already prepared for this technology.